Collins Center for the Arts Presenting Peg + Cat Live! Sen. Susan Collins, right, chats with a worker at Bath Iron Works in June. Advocates for raising the federal minimum wage are ramping up a social media campaign to urge lawmakers to take action when Congress resumes next week. One of their targets is Maine Republican Sen. Susan Collins. 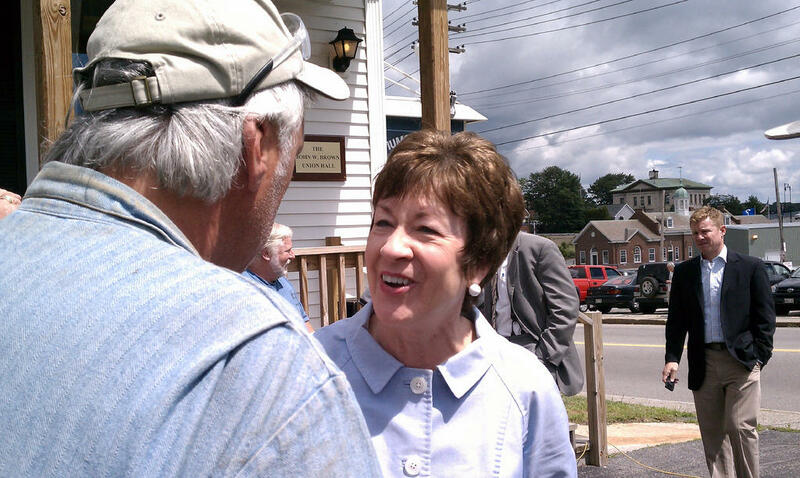 Collins is seen as having a key role in bringing a filibustered bill back on the floor. But election year politics may get in the way of any movement on the issue. Patty Wight reports on debate in the U.S. Senate over raising the minimum wage. When Augusta City Councilor Dale McCormick thinks about the jobs being created in her city, she says, by and large, they're low-wage, retail jobs. The kind of jobs, she says, that more and more adults have to rely on, sometimes working 60-plus hours a week just to get by. "It's just anti-American to think that a person could work that much - that many hours - and not be able to support their family," McCormick says. "We need to hike the minimum wage." McCormick, a former Democratic state senator who also ran for Congress, is co-chair of the Maine Unitarian Universalist State Advocacy Network, which is partnering with the Unitarian Universalist Service Committee to push for an increase in the federal minimum wage. Their campaign is called "Wage Outrage," and they're calling on Sen. Susan Collins, specifically, to help resurrect a bill that would boost the minimum wage from $7.25 an hour to $10.10 an hour. "The action on this bill is focused in the Senate, and Susan Collins voted against allowing this issue to come up for a vote," McCormick says. Collins says she - like most other Republicans - didn't support the bill introduced last year by Democratic Sen. Tom Harkin. "I have supported many increases in the minimum wage over the years, and I am prepared and working on supporting one now," Collins says. "But I think it would be a mistake to go all the way to $10.10." A Congressional Budget Office Report found that hiking the minimum wage to $10.10 would directly benefit 16 million workers, but would also result in a loss of half-a-million jobs. Collins tried to broker a compromise of $9 an hour, which she says would only cause a loss of 100,000 jobs. But Democratic Sen. Majority Leader Harry Reid refused to allow any changes to Harkin's bill. "What we have now really typifies what's wrong with Congress," Collins says. Collins says there's a wide margin between the current federal minimum wage of $7.25 an hour to $10.10 an hour. "So if we're really caring about two-income families, why don't we come up with a number that is in-between?" she says. Collins says she'll attempt a compromise once more, and has convened a group of centrist senators to help. Independent Sen. Angus King says he's had discussions with Collins and Democratic senators about possible alternatives. "Whether it's a somewhat lower amount, a longer phase-in, whether or not to apply a cost of living adjustment, there are lots of pieces to this," King says. "And it seems to me we ought to be able to come to some sort of consensus." But University of Maine Political Science Professor Mark Brewer says that may be a tall order this particular congressional session. "Given where the leadership has staked itself on this, and the fact that it's an election year, and that the control of the United States Senate is so hotly contested, I would guess no," Brewer says. With mid-term elections two months away, raising the minimum wage could emerge as more of a political tool for Democrats if Republicans don't support it. But Brewer says considering Collins' support of minimum wage increases in the past, she'll likely be spared. "If you're a Democrat can you use this to bash Republicans? Sure," he says. "Can you use it to bash Susan Collins? That's more difficult to do." Congress reconvenes on Monday Sept. 8.